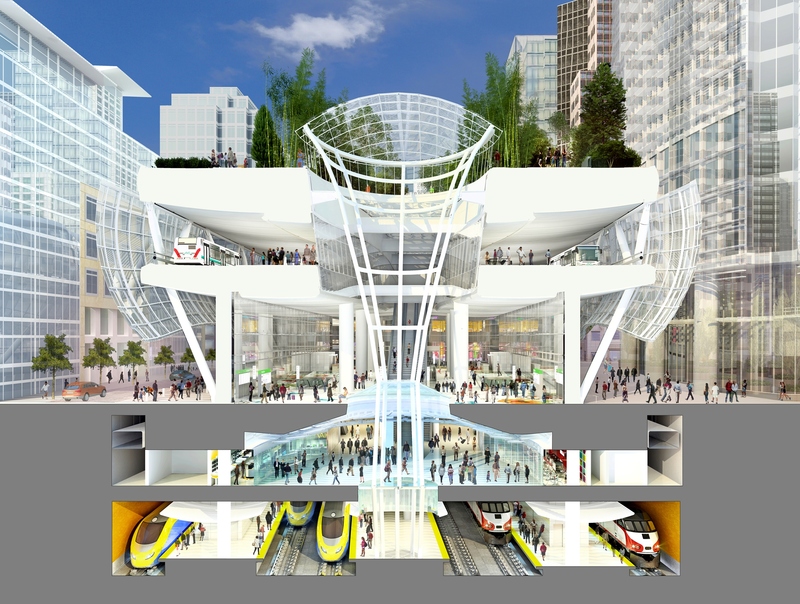 The new Transbay Transit Center (TTC) is scheduled for completion in 2017. The foundation of the TTC, and the thing that makes it such an improvement over the old Transbay bus terminal it’s replacing, is its underground train station for Caltrain and High Speed Rail. It will bring Caltrain, the connection between San Francisco and Silicon Valley, into close proximity with five Muni and four BART lines and over 40 bus connections, not to mention San Francisco’s huge downtown employment center. The TTC should one day be the most important transit hub outside of New York City—a Grand Central Station of the West. Now imagine that Grand Central without any trains. That’s what San Francisco will have if it doesn’t get working soon on a 1.3 mile downtown rail extension (DTX), to actually bring the trains from Caltrain’s current King Street Station to the TTC. Years ago, the City and County of San Francisco appropriately identified DTX as its number one candidate for Federal New Starts funding. The Metropolitan Transportation Commission ratified the selection and the Federal Transit Administration approved it. The DTX enjoys the strong support of both California Senators and Congresswoman Nancy Pelosi. In Sacramento, it is recognized for its importance to all of Northern California. In November 1999, SF voters approved Proposition H by nearly 70 percent. The law mandates that “The Mayor, the Board of Supervisors, the SF Transportation Authority, and all relevant city officers and agencies shall take all appropriate actions to generate the revenue necessary to finance the Caltrain extension downtown.” In November 2003 the SF voters approved Prop K by 75 percent, which provided $270 million for it. In June 2010 the voters approved Prop G by nearly 84 percent, calling for high-speed trains to go to the TTC. Clearly, voters want trains in their new station. But DTX barely registers with the current regime at City Hall. It is surely expensive, at about $2.6 billion of the overall $4.5 billion project budget. But considering the importance for Bay Area commuters, the City needs to start looking hard for those funds. San Francisco is so far allocating less than three percent of DTX’s costs, compared to the nearly 35 percent allocation to the relatively low projected ridership of the Central Subway project. Why do City officials continually talk of finding additional funds to extend the Central Subway, build Bus Rapid Transit on Van Ness and Geary, bring the Warriors to town and “beautify our streets”—but they don’t talk about building DTX? Is City Hall failing to recognize how embarrassingly empty its TTC will be without trains and the tens of thousands of daily riders they bring? Maybe the City is forgetting all the additional commuters who will drive cars to and from San Francisco? Or maybe they just think someone else will rescue the project? The financing for DTX will come from the City and County of San Francisco, the Transbay Mello Roos District, San Mateo County, Bridge Tolls, Caltrain surcharges, California Cap-and-Trade funds, CaHSRA, the federal New Starts Program, and private investors. But only the City of San Francisco has the savvy, financial muscle and political clout to pull it all together. The project needs serious and ongoing advocacy from Mayor Lee and the rest of City Hall—so far, there are no signs of it. The heart and foundation of the TTC is Caltrain and High Speed Rail. With the right leadership, Caltrain can be running into the station by 2023. Without it, San Francisco will have built a humongous bus stop and a monument to civic incompetence. Gerald Cauthen is co-founder of the Bay Area Transportation Working Group and SaveMuni. He has managed the design and construction of Muni, San Francisco Water Department and Hetch Hetchy infrastructure projects. Appendix K) indicated that for most of the day, the terminal capacity is constrained to 4 to 5 trains per hour. The memo in Appendix K contains on PDF page 45 the now notorious Caltrain timetable that shows the majority of Caltrain runs terminating at 4th & King. Apologies, my positioning was off. I forgot its proximity to Market Street. San Francisco's Downtown Extension (DTX) project, to get Caltrain and future High-speed Rail into the Transbay Transit Center, may finally be back in motion. The San Francisco Planning Department will be presenting the San Francisco Board of Supervisors with updated plans for getting trains from the Caltrain corridor into the lower level of the Transbay Transit Center.